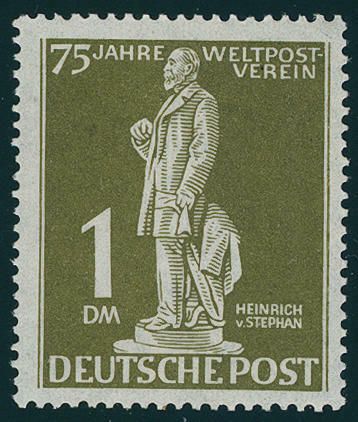 6448 ∆ 20 5 Mk. 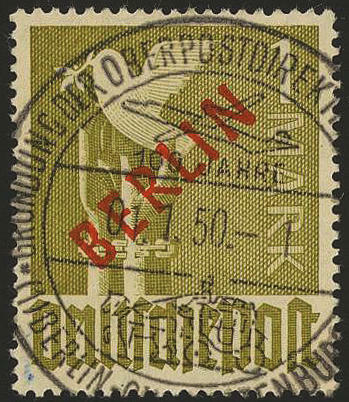 Black overprint, fresh colors and very well perforated on beautiful letter piece, centric cancellation \"BERLIN-CHARLOTTENBURG\". Photo expertize \"the quality is perfect\" Hans-Dieter Schlegel BPP. 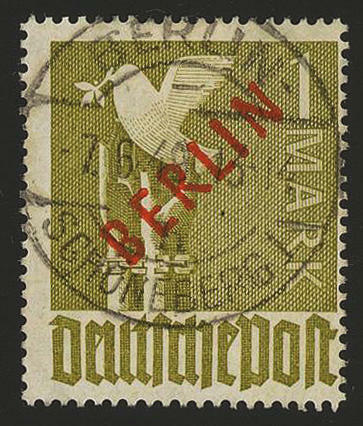 6449 21/34 Red overprint 1949 uniform from the left lower corner of the sheet, unfolded, in perfect condition with clean small hinge, expertized Schlegel BPP. 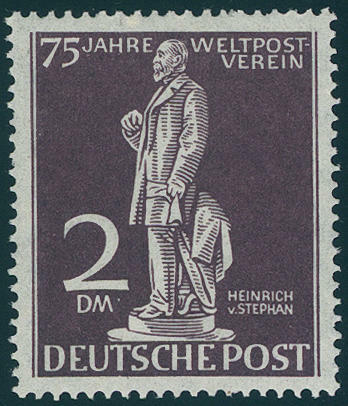 6450 21/34 Red overprint 1949, fresh colors and in perfect condition unused with neat trace of a hinge, expertized Schlegel BPP. Michel 550,- €. 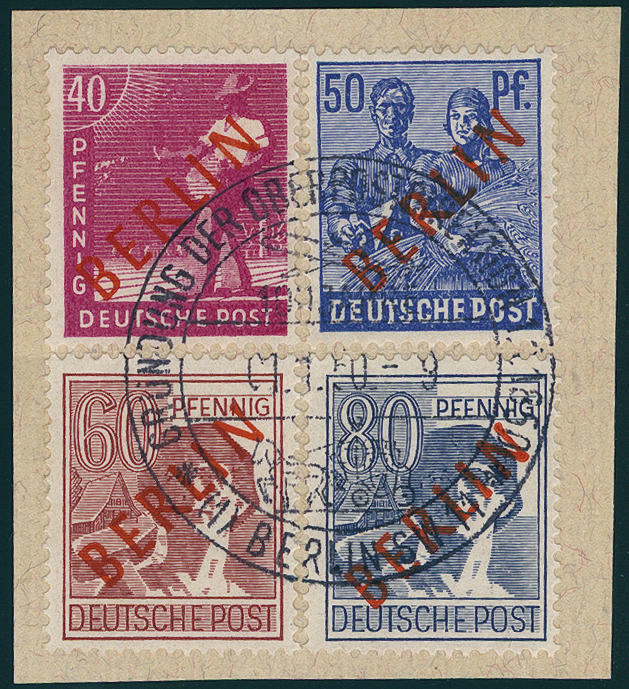 6451 ∆ 21/34 Red overprint 1949, all 14 values on beautiful letter pieces with perfect special cancellation \"BERLIN foundation the regional Directorate of Post 1.11.50. 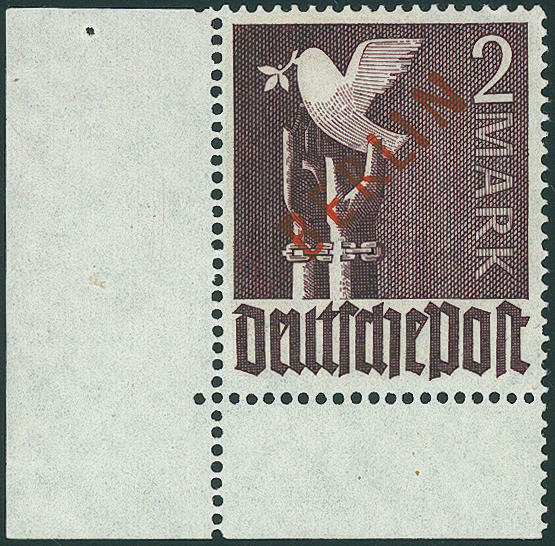 \". An outstanding set for the highest standards! Photo expertize Schlegel BPP. 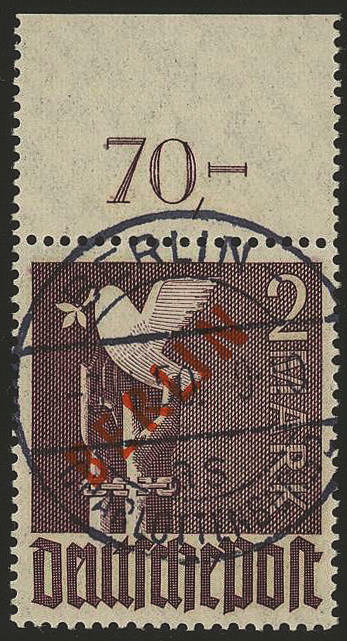 6452 24F 10 Pfg. 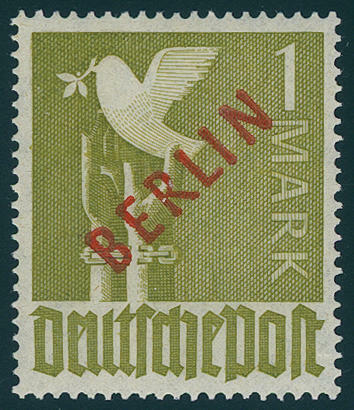 Red overprint, block of four from of the right lower corner of the sheet, as well the lower stamps without overprint, fresh colors and very well perforated, mint never hinged, right vertical pair small affixed spots in the middle, hinge trace only right in the margin of sheet. 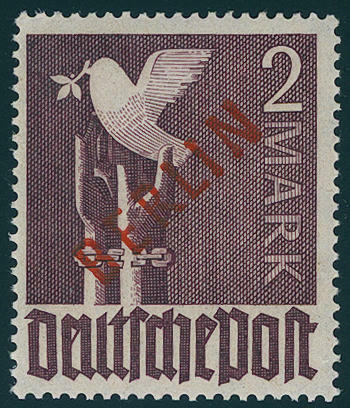 An extremely scarce, perfect undervalued variety and in this kind as corner margin block of four an unique! Photo expertize Schlegel BPP. 6453 ✉ 26,32 20 Pfg. And 80 Pfg. 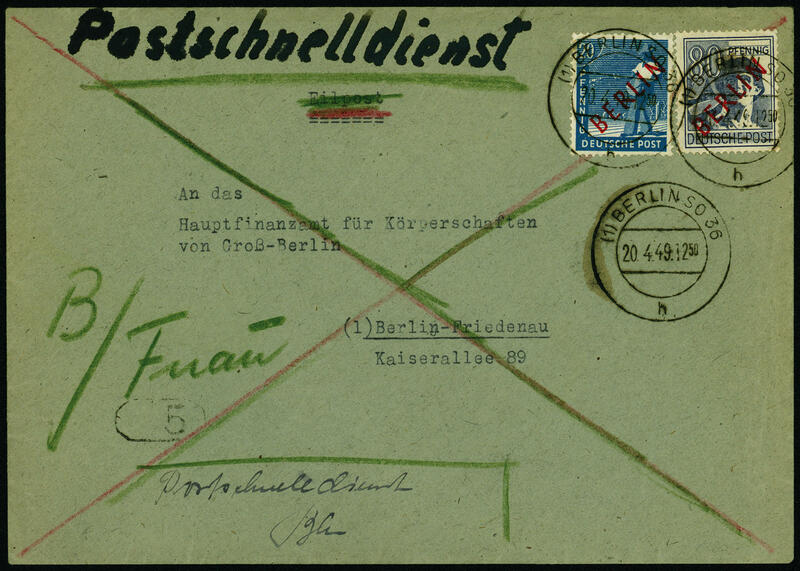 Red overprint on very nice correctly franked fast postal service cover from \"BERLIN SO36 20.4.49\" to Berlin-Friedenau, clean requires moderately used with arrival postmark, very rare, expertized Schlegel BPP. 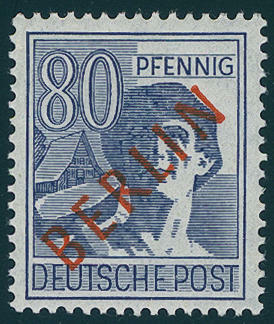 6454 27,32 25 Pfg., 80 Pfg. 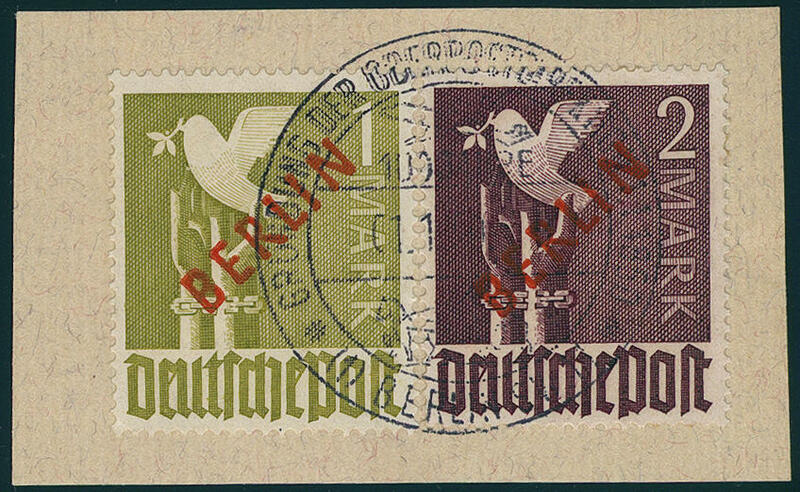 Red overprint, fresh colors and in perfect condition mint never hinged, expertized Schlegel BPP. Michel 230,- €. 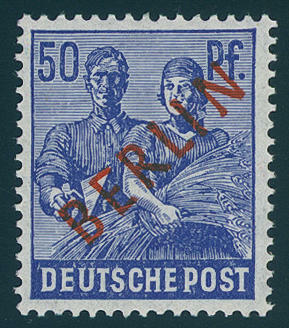 6455 30II 50 Pfg. 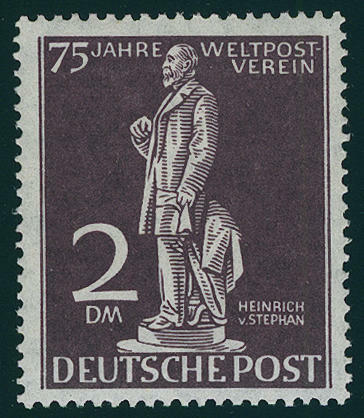 Red overprint with overprint error \"upper E-bar extended\", which only on field 44 and 94 in a part of issue occurred, in perfect condition mint never hinged, expertized Schlegel BPP. By Michel catalogue in mint never hinged condition unlisted! 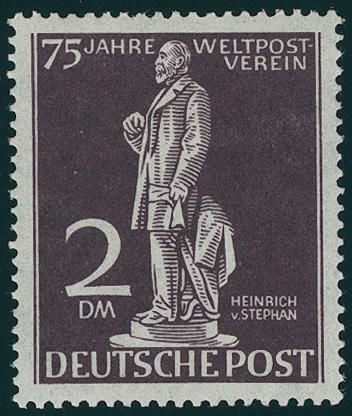 6456 33 1 DM red overprint 1949, fresh colors and in perfect condition mint never hinged, expertized Schlegel BPP. Michel 550,- €. 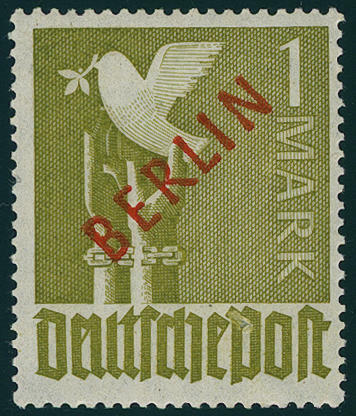 6457 ⊙ 33 1 DM red overprint, fresh colors and in perfect condition, with centered special cancel \"BERLIN-CHARLOTTENBURG a hundred years foundation the regional Directorate of Post 1.1.50. \". 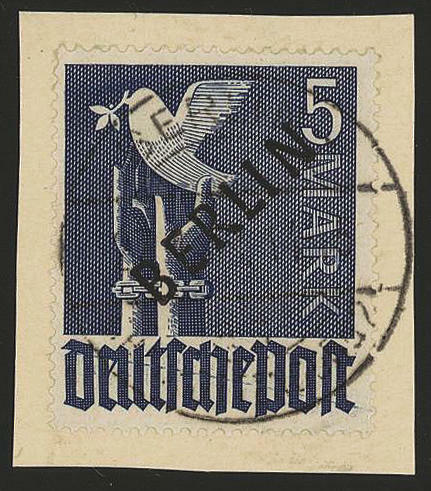 Expertized Rehfeld (slightly visible on the back), photo expertize \"the quality is perfect\" Hans-Dieter Schlegel BPP. 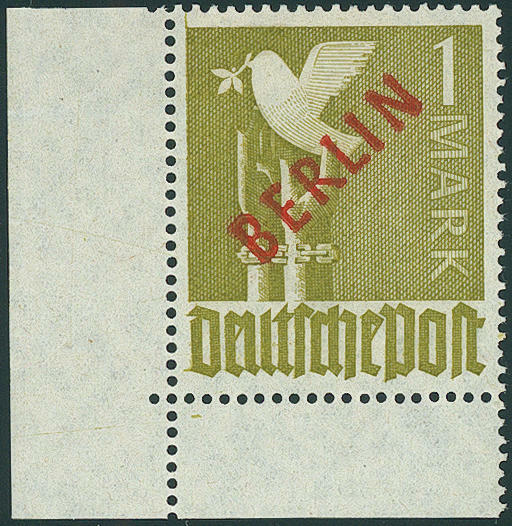 6458 ⊙ 33 1 DM red overprint, fresh colors and in perfect condition, very fine centric and neat cancelled \"BERLIN-SCHÖNEBERG 7.6.49\". Photo expertize \"the quality is perfect\" Hans-Dieter Schlegel BPP. Michel 550,- €. 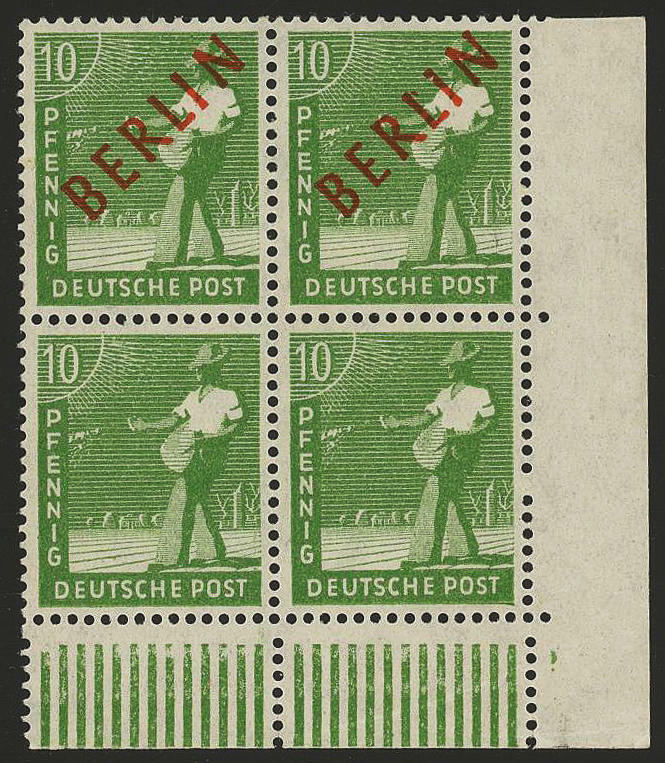 6459 ⊙ 33/34 1 DM and 2 DM red overprint, fresh colors and neat cancelled, in perfect condition, expertized Eliades BPP respectively Schlegel BPP. Michel 830,- €. 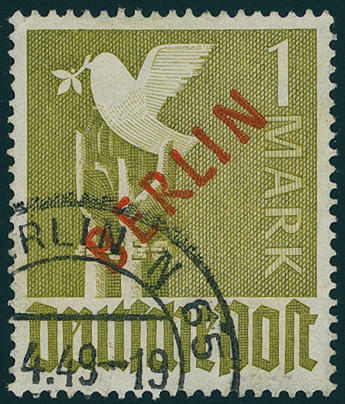 6460 ⊙ 34 2 DM red overprint, fresh colors and in perfect condition with centered neat postmark \"BERLIN-CHARLOTTENBURG 3.1.50\", upper margin prefolded, as far as in perfect condition, expertized Schlegel BPP. 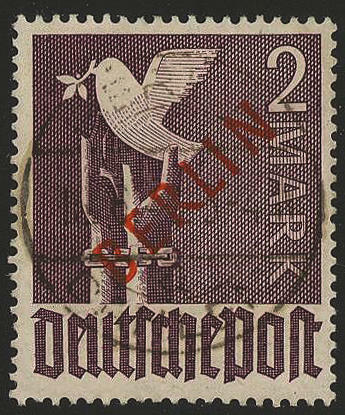 6461 ⊙ 34 2 DM red overprint, fresh colors and in perfect condition perfect centric cancellation \"BERLIN\", expertized Schlegel BPP. Michel 280,- €. 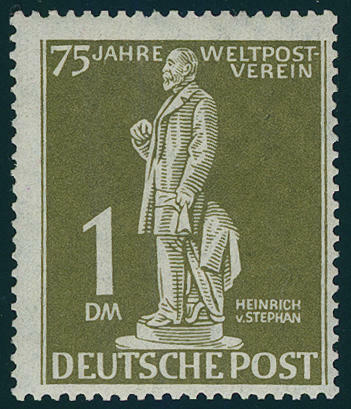 6462 35/41 Stephan set 1949, fresh colors and in perfect condition mint never hinged, without any signs. 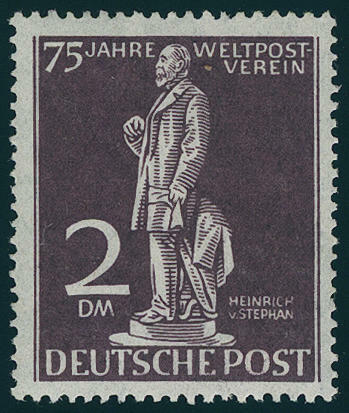 Photo expertize \"the condition is perfect\" Hans-Dieter Schlegel BPP. Michel 750,- €. 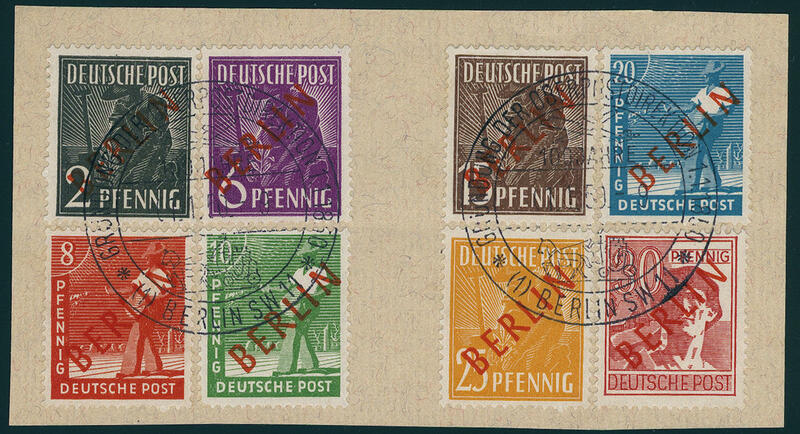 6463 35/41 Stephan set 1949, fresh colors and in perfect condition mint never hinged, photo expertize \"the condition is perfect\" Hans-Dieter Schlegel BPP. Michel 750,- €. 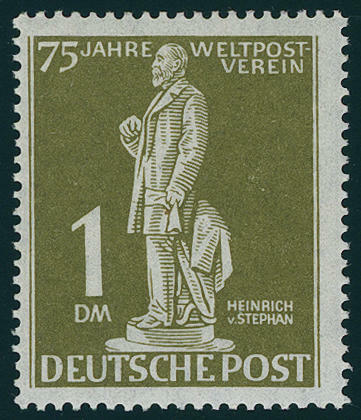 6464 35/41 Stephan 1949, fresh colors and in perfect condition mint never hinged, without any signs. Michel 750,- €. 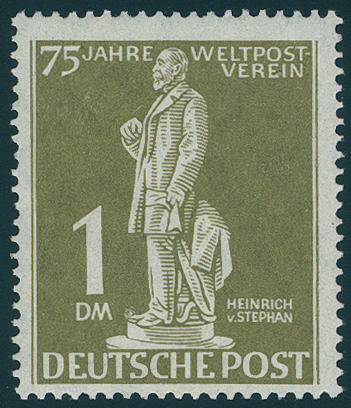 6465 35/41 Stephan set 1949, fresh colors and in perfect condition mint never hinged, Mark values expertized Schlegel BPP. Michel 750,- €. 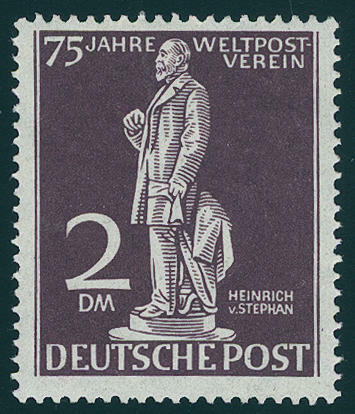 6466 35/41 Stephan set 1949, fresh colors and in perfect condition mint never hinged, expertized Schlegel BPP. Michel 750,- €. 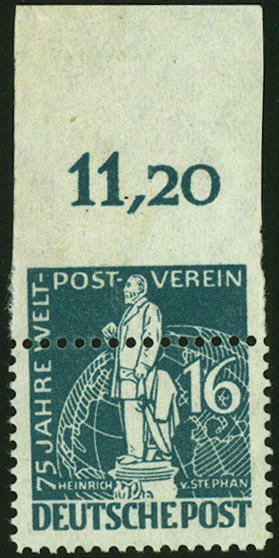 6467 36Abart 16 Pfg. 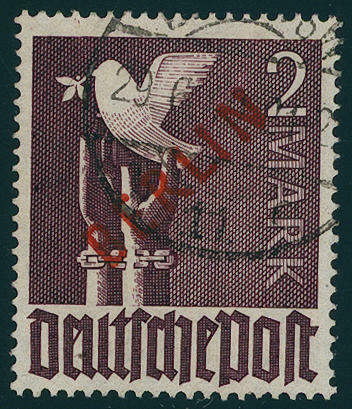 Stephan 1949, upper perforation row strong downward displaced, through it above unperforated and to the sides partially perforated, from upper margin, in perfect condition mint never hinged very decorative and scarce variety, like they especially by the early issues Berlin due to the stringent controls in the Federal Printing Office hardly once occurs!